Welcome to the 46th edition of the Carnival of Divided Government - The Special "National Dividist® Day of Celebration" Edition. OK - So we missed posting this on the actual National Dividist Day of Celebration which occurred on January 5th - the first day of our recently divided brand spanking new 112th Congress and government. Your loyal blogger was distracted by other pressing issues, so this carnival was delayed and subsequently renamed to the "Special National Dividist® Month of Celebration - A Nostalgic Look Back" Edition. As explained in earlier editions, we have adopted Latin ordinal numeration to impart a patina of gravitas reflecting the historical importance of the series. In this the Carnival of Divided Government Sêdecim et Quadrâgintâ (XLVI), as in all of the CODGOV editions, we select volunteers and draftees from the blogosphere and main stream media writing on the single topic of government divided between the major parties (leaving it to the reader to sort out volunteers from draftees). Consistent with this topic, the primary criteria for acceptance in the carnival is to explicitly use the words and/or concept of "divided government" in submitted posts. A criteria that, to our endless befuddlement, is ignored by many of the bloggers submitting posts, which sadly results in The Dividist reluctantly ignoring their fine submissions. Among the on-topic posts, essays and articles we choose our top ten favorites for commentary and consideration. We hope you enjoy these selections, particularly in this, the first edition of the Carnival to be posted under a Divided Government since the 28th edition was posted on October 31, 2008 . We look forward to enjoying at least two years of a noisy, fractious, bickering and bitterly divided federal government, just the way the founders intended. "In a State of the Union address marked by the symbolic comity of Democrats and Republicans sitting next to each other instead of across the aisle of the U.S. Capitol, Obama asked for bipartisan cooperation with the opposition party now in control of the House. Two years into his presidency, his appeal signaled an effort to reclaim the promise of his historic campaign in 2008, in which he asked Americans to embrace a less-partisan approach to governing that set aside old arguments... After two years of battles over his health-care overhaul and other major initiatives, and the rise of the opposition Tea Party movement, Obama again offered the possibility of greater cooperation." 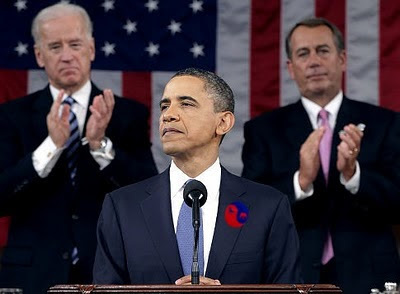 The Dividist is reminded that the SOTU is mosly theater, and also just noticed that he neglected to post his traditional SOTU show tune linkfest this year. As pleasurable as the lyrics may sound in the speech, the real governing tune is yet to be heard and only to be revealed in the actions of the administration leading the 112th Congress band in the upcoming legislative parade. Perhaps it is not too late to continue the series... perhaps with something from The Music Man. Stay tuned. A recent edition of The Economist also reflected on the SOTU speech and the challenges President Obama faces during "Crunch time - America’s president faces a divided government and a mountain of debt:"
"Welcome to the masochistic pleasures of divided government in America. For two years the Democrats controlled both ends of Pennsylvania Avenue. That did not give Mr Obama the power to enact every measure he wanted (an energy bill and immigration reform were two that fell by the wayside), but the 111th Congress was indeed extremely busy. The Democrats poured hundreds of billions of borrowed dollars into efforts to stimulate a sagging economy, bailed out Detroit’s failing carmakers and passed scores of laws, including one to reregulate the financial sector... 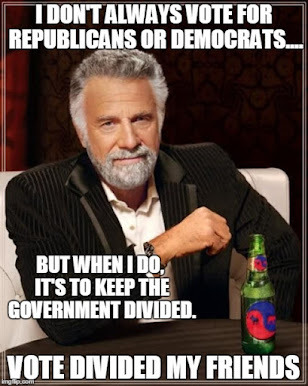 Polls show that Americans like divided government. Its fans say that it forces politicians from opposite ends of the spectrum to seek common cause in the centre. “We will move forward together, or not at all, for the challenges we face are bigger than party, and bigger than politics,” said Mr Obama in his speech. For the time being, however, the parties are preparing for battle, not discussing peace terms." As it should be. With both parties firmly holding a grip on real power, we will enjoy better, more fiscally responsible governance as a consequence. As well as a lower probability of purely partisan legislative abominations like the Porkulus and Obamacare legislation. "Passions have subsided, I suspect, because conservatives are less enraged now that they feel they have a voice in the government. Independents repeatedly say in polls that they are fine with divided government. So that leaves only liberals who are really unhappy, witness the 43% who want more changes. I wasn't happy on election night, Lord knows, but I guess in many ways Obama is better off with a divided government. If the Democrats ran everything, the Republicans, so expert at whining in opposition and ginning up phony accusations, could continue blaming every single bad thing that ever happened on the Democrats. And now, in independent voters' minds, the suspicion that Democrats are going to try to jerk the country to the left are null and void. They know it can't happen. The president and the GOP House have to fight over the middle, which is how the middle likes it, and which is probably on balance good for the country. The problem is that the middle is way to the right of where it once was, even 15 years ago. Remember, just 15 plus three years ago, Republicans were solidly behind a healthcare plan pretty much just like the one they're going to vote to repeal tomorrow. Divided government has its upsides, and seeing Obama fighting harder for the middle, as we'll see this year and next, will be good. But at some point, the Democrats have to think of something to do about the fact that the middle keeps moving right." The Dividist is not sure Mr. Tomasky could get any more convoluted here. He acknowledges that divided government is good for the country but complains that it prevents passing legislation like Obamacare, which is wildly expensive, incomprehensibly complex, does not do what it's proponents set out to accomplish, increases the burden on employers, increases the cost for individual policies, shifts an enormous financial burden to cash-strapped states, and is an all-around terrible piece of legislation. Not to mention - unconstitutional. The Dividist is also not sure what 1993 Republican supported legislation Tomasky is referencing. Whatever it was, neither that legislation nor Hillarycare passed in either the united 1992-3 nor the divided 1994-2000 government. It took an overwhelmingly unified Democrat government and a purely partisan vote to cough up the Obamacare hairball. 'Nuff said. "I have always held the notion that a divided government, in which the President’s opposing party controls at least one house of Congress, is better for economic performance than the alternative. I held this view because in a divided government, nothing gets done... However, it turns out that my intuition proved to be wrong, at least over the time periods I observed. The 10-, 20-, 40-, and 60-year average returns all show that the market outperforms during a period in which one party controls both the White House and Congress and underperforms during a period of division. I do not understand why this is the case. I can only speculate. Perhaps one-party control provides investors with more certainty over future fiscal and economic policies, whereas a divided government generates more uncertainty. One way to test this hypothesis would be to measure the S&P 500’s average volatility each year. If volatility were higher during periods of divided government, this observation might support this hypothesis." The Dividist is impressed with the analysis, but Sean gets a few things wrong. As he is not very specific about his methodology, the Dividist is not sure how he is coming up with comparable 10, 20, 40, and 60 year averages for divided vs. united government over presumably the same time periods, nor does he identify the dates he is using for periods of divided and united government. More significantly, by utilizing only these undefined long term averages as the basis for his comparison, he is missing the most important and possibly only market effect one should expect in divided vs. united government stock market analysis - to whit: short term swings based on investor sentiment. The stock market is a discounting mechanism - which is another way of saying that the market is a reflection of what investors believe today about what will happen tomorrow - maybe 3, maybe 6, maybe 12 months down the line. To the extent that a change from a united to divided government - or a Republican to Democrat switch in power - 0r a Democrat to Republican switch in power - or any such partisan variation is at all useful to an investment thesis, the most opportune time to take advantage of it is probably months before the change actually occurs in an election. Any such change is likely to be a short term rather than long term effect (measured in months not years and certainly not in decades) and based on sentiment - not logic. The important point is that the effect will be seen in the stock market long before the change actually takes place. And yes... The Dividist made that bet last July. Thank you very much. Jonathan Strong at The Daily Caller reviews a recent Cato Institute study authored by Marcus Ethridge on the beneficial effects of gridlock in "Cato study bucks conventional wisdom, and instead touts cantankerous divided government:"
"I'm a big fan of divided government. R's and D's can crow all they want and it doesn't matter because we have sweet, sweet gridlock." Well said Justin. Hmmm... Perhaps there is something to this 140 character business after all. The Dividist notes that he now has 13 followers on Twitter and still has yet to send a single tweet. Perhaps the time has arrived. Perhaps he should retweet Justin's pithy and profound sentiment. Perhaps... not. "For the first time in Virginia history, legislative redistricting will take place in 2011 under conditions of divided government: the state Senate is controlled by Democrats, while the House of Delegates and governorship are under Republican control. In an interview, political scientist Michael McDonald discusses the implications of those circumstances... Whether the redistricting process will fall victim to partisan bickering, or whether conditions of divided government actually make the process fairer and more transparent, both remain to be seen." The Dividist tends to focus primarily on the Feds but, as Rick points out, there are some really interesting ramifications to watch at the intersection of the census, redistricting, and 2010 election results. Although we now have One Party Democratic Rule in California, the redistricting process was stripped from the legislature by voter proposition. 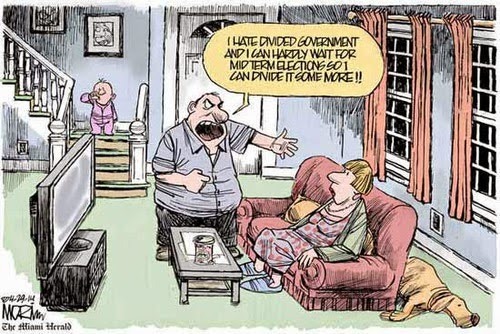 The Dividist can't wait to see how that turns out. Get the popcorn ready. "None of this was particularly surprising. It’s clear that both parties have decided that a period of divided government twelve months before a presidential election is the wrong time to make big moves on entitlements and the deficit. Better to wait, jockey for position, and hope that the correlation of forces after 2012 will be more favorable to their preferred solutions. And it’s clear, too, that they’ve decided (with honorable exceptions) that it’s too risky to even begin building support for the unpopular cuts or tax increases ahead. The bet, on both sides, is that there’s still time to work with, and that the other party will blink, or at least give ground, before the real crunch arrives. Let’s hope they’re right." I can't help but think that Big Tent and Matt Yglesias are hoping against hope that Ross Douthat is right. The Dividist thinks they are all wrong. There are enough newly elected Republicans who (like President Obama) recognize that their reelection prospects are significantly enhanced by getting on the right side of history with some tough decisions on spending and entitlements. The Dividist optimistically believes we are going to see meaningful change in the next two years. To paraphrase the political sage Mick Jagger, it won't be what we want, but it'll be what we need. Our deficit and debt problems are the result of conscious and continuous actions - and yes, consensus ones. The media currently bemoaning gridlock as an obstacle to solving our current deficit predicament at the same time refuse to acknowledge what got us here in the first place. Spending is the cause of the budget problem, and it was consensus that was the cause of the spending. America’s political history is of a government operating under checks and balances. Regretfully, its budget history is one of operating out of balance, owing to the writing of checks. Balance in the government is the better alternative to achieving balance in our budget. And it is because that it is the better check on writing checks." So true. The Dividist wonders if this former GWB administration Treasury official will still feel this way when he realizes that the only way to maintain a politically balanced and divided federal government in 2013 will be by reelecting Barack Obama in 2012. Those insights could be particularly useful to Obama over the next two years. If there was one overarching miscalculation during the president's first two years in office, it was the assumption that he could lead the public faster than the public was willing to be led. Whether on health care or the economy, Obama acted boldly - and in his view out of necessity - but failed to persuade the public of the rightness of his actions. Daley warned of this danger more than a year ago, anticipating the losses the Democrats suffered in November. Rowe's memo is a powerful reminder of what Obama should expect from the new Congress, why confrontation is to be expected and why winning the battle for public opinion should always be in the forefront of his mind. 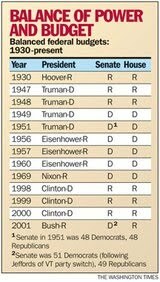 After all, the 1948 elections turned out well for Truman." The bucks stops here... or over there... or somewhere. Good Luck Mr. President. For this edition, we offer Dr. Robert Muller presenting The Right/Left Hoax posted at Global Freedom Strategies wherein we find some useful links to on-line political tests and a curious mix of insight, naivete, dusted with a light touch of paranoia. Look for the next edition of The Carnival of Divided Government Septem et Quadrâgintâ (XLVII) - Special Dividist® Ides of March Edition - on or about March 15th, unless we decide to move it up to the Special Presidents Day Edition, or delay it until the Special April Fools Day Edition, or All of The Above. Submit your blog article at carnival of divided government using our carnival submission form.